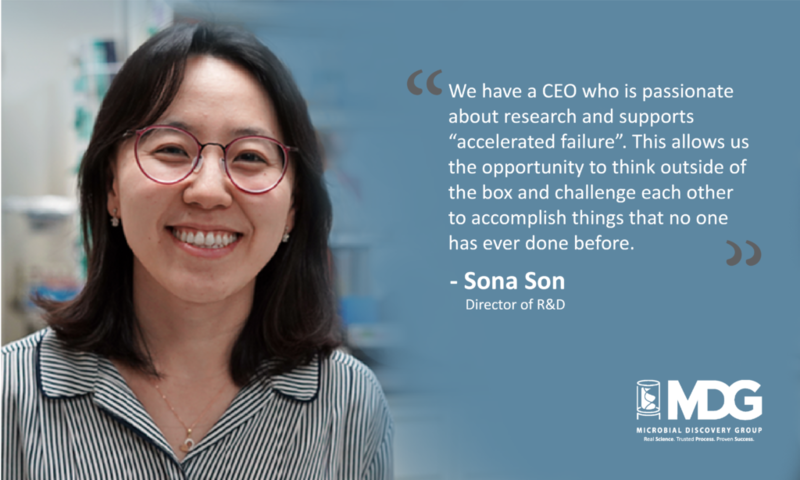 Sona Son is one of Microbial Discovery Group (MDG)’s first employees and was hired back in 2008. Her role has evolved over the past decade, but her passion remains the same: utilizing real science to solve real problems. I joined MDG in 2008 as a recent college graduate. Back then, the building was still under construction, so I had to wear a hard hat on my first visit. The conference room where I was interviewed did not even have a conference table – only two folding chairs and a whiteboard! I was drawn to MDG because of that – the opportunities to make an immediate impact and continue to learn and grow. Most of all, I was inspired by Mike King’s passion and enthusiasm toward research and the company’s future potential. This can really vary! In my role, I work across departments and have the opportunity to make a difference on a daily basis. I spend a good portion of my time in meetings where I focus on everything from big picture items to day-to-day challenges. Between problem-solving both short and longer-term R&D ventures, I oversee a team working on a multitude of projects at any one time. I like to clear obstacles, helping to push projects forward while also finding the time to meet one-on-one with my team members to help support them in their personal growth goals. As I mentioned, my day-to-day varies immensely. As a high priority, I have been collaborating on product launch materials for our new Institutional and Consumer market offering, coming soon! I am also leading and reviewing R&D data for product development and support, historical fermentation data for yield improvement, new technology assessment and IP (intellectual property) related legal documents. 4. What is the most inspiring part of your job? Vision: Every day, I know I am making a positive impact towards MDG’s vision – to Feed, Clean, and Save the World. Growth: When people ask what I like most about my job, the answer has always been that there are never two days that are the same. I learn and grow every single day. People: I get to interact with people who share the same vision and cultural values. 5. What do you like to do when you’re not at the office? Mostly, I spend my time with my family and friends. I like to experience new things, so I enjoy going out to new restaurants, coffee shops, or traveling to new cities. 6. Professional goal for the next 5 years? With more opportunities to lead, I have realized that the development of people is one of the most difficult, yet most fulfilling responsibilities. I believe that “A company is but a sum of the people therein” and all of our success depends on our people. I am blessed to have great team members, and I want to make sure I can support their growth through challenging assignments, giving feedback, and celebrating their accomplishments. My goal is to continue focusing on the growth of the company while building our future leaders. MDG is a basic R&D driven fermentation company. What makes us so unique is that we have passionate teams who can provide a complete solution from R&D to commercial application. We are continuously working on new ways to harness the capabilities of Bacillus. Our R&D team focuses on pushing the envelope and looking for ways we can solve real problems for our current and future customers. This is supported by a CEO who is passionate about research and supports “accelerated failure”. Allowing for the opportunity to think outside of the box and challenge each other to accomplish things that no one has ever done before is what makes MDG so different.